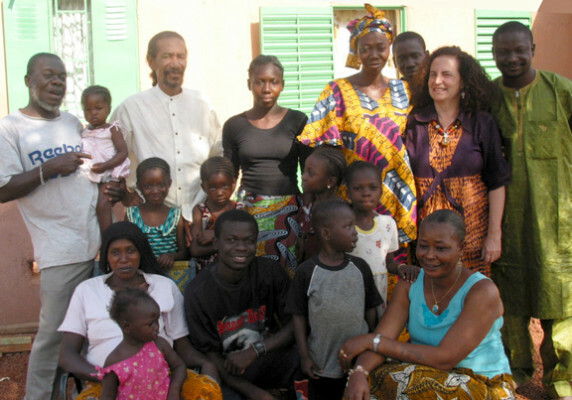 Janet Goldner, Colleagues and Friends in Bamako, 2008. 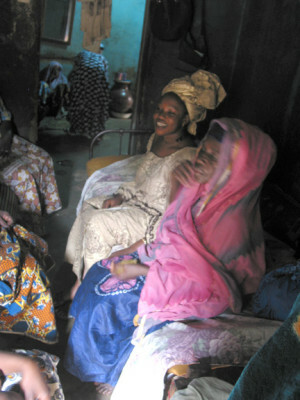 Janet Goldner and Kletigui Dembele interviewed a diverse group of Malians about family and community. 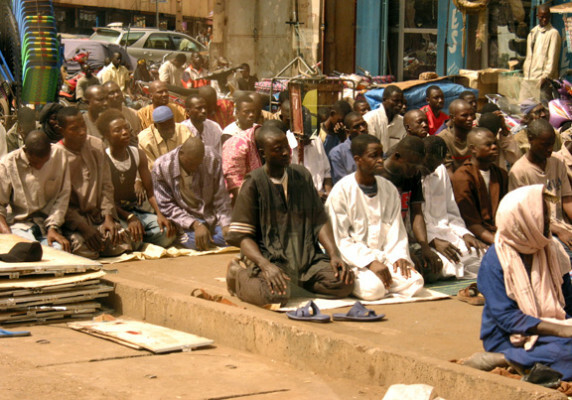 The Malian family is large. There are many people. Your family is not only those who are from the same mother and father as you. The family is also your cousins, male and female. It is also your aunts, your uncles, your grandparents. The neighbor can be a member of the family. The Malian family is very, very big, very complex. There are many relationships that we find in our families. 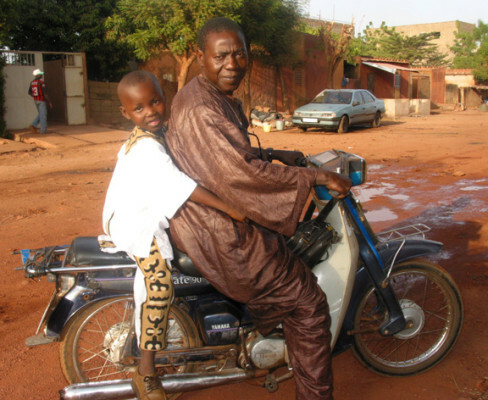 If we take a typical Malian family for example, you will find someone with absolutely no blood relationship with the other members of the family yet who is entirely a member of the family. There are also the ties of friendship that create situations like that. Your father who adopts the son of his friend who therefore becomes your brother. You will be educated together. You will grow up together. You will do everything together and you will consider him exactly as you consider your other brothers. The family is a community because in the family, there are many people who could raise a girl that is not their own daughter. She could be the daughter of your neighbor, not even the daughter of your own sister but the daughter of a neighbor who becomes your daughter. There are many ties that are like this. There are those who take the name of their adoptive family. For example, if you raise the daughter of your cousin, when she is young, no one will know her real family name. If she didn’t go to school and she didn’t have legal documents, the girl will have the name of the family in which she was raised. Therefore really no one will know her family name. Not even her. 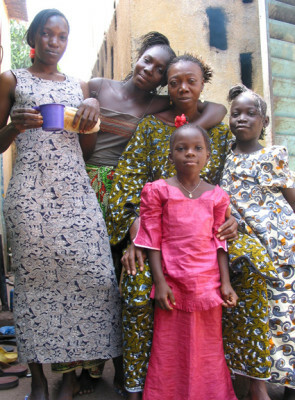 The family in Mali is sacred. A woman, if you are not from a good family, it is difficult to succeed in life, even in the domain of work. 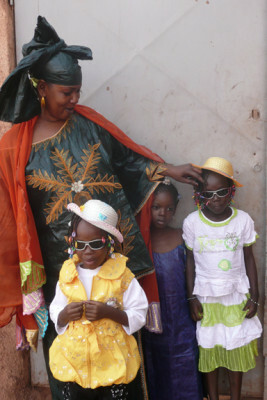 Practically all the families know each other in Mali. “Ah, that one, Don’t marry her. She comes from a family like that. Don’t marry her because her family is … The family is sacred. The Tamashek community has a nomadic tradition. A nomad is someone who moves from place to place, choosing his place of installation because of his animals. … The family is like all families. It is the father, the mother, the children with a particular habitat which is the tent. … It is the group of tents that makes a camp. A group of camps make a fraction and many fractions make a community. I will talk about my fraction. We all speak Tamaschek. A fraction is like a neighborhood in the nomadic mileau. The fractions are those who share the same problems. We agree to pay our taxes. We have a leader that we call the chief of the fraction who has advisors. Everyone refers to the chief of the fraction in the case of problems. To regulate their social problems, to manage their marriage problems, the difficulties that we all could face. When we have problems that depass the fraction, the other fractions could join us because generally it is brothers who are separated. They separate to safe guard the well being of the family. If everyone stays in the same room and the roof fall in, everyone will be decimated. It is necessary to have people in different places. People have heads not only to wear their hair. They are for reasoning also. For example, Dembele, when he is in the street, he does something that is not good. It is a Traore father who can correct him, who could give him a lesson, who could moralize. Therefore, the child is taught by the community. That is why I say that that a community are people with a common destiny. It is many families that make a community. My community is composed of the living and the dead. The community could not exist without the family. The family could not exist without its elements, without the parents, without the children, without the grandchildren, without the uncles, without the aunts. When we say the family, it doesn’t suggest the nuclear family like in the US. The family here starts with the grandparents and goes to the small children passing by the parents of the mother, the parents of the father. All of these people constitute the family. If it wasn’t in this period where life has become more and more expensive, living space has become more and more expensive, all these people would live in the same compound. The best thing in a family is that the current pass between them, that there is dialogue and tolerance that permits a family to live. The best thing in the family is first the affection that is created between the members of the family because when we live in community and when we live alone, its not the same thing. When we live together, there is always the love, the affection that you create. The best thing in the community is to work together, to make a clean environment and protect the people of the community and to bring all that the family and the community needs. The best thing in my community is that everyone takes care of the life of everyone. When a woman in the community gives birth to a child, the whole community is informed. Here it is seven days, all the women prepare sauce, meat and other food. We give it to the woman who has given birth. She eats for seven day to regain her energy. And the day of her baptim, that day, the whole community comes with little presents: cloth or soap or jewelry. It depends on what you are able to offer. The whole community comes together. It gives you really, the day of your baptim, you say to yourself, “I have the support of my whole community. I am liked. You feel protected. You know that you are part of a strong community. Here, if you see your superiors, even if you don’t know them, you must respect them. Respect comes first. In times past, if an older woman saw you with a man, even if she wasn’t a member of your family, she would say, “Ah, stop that. Its not good.” We, here, we have respect. All people are family. Even if there is nothing, you do not know them, you must respect them. 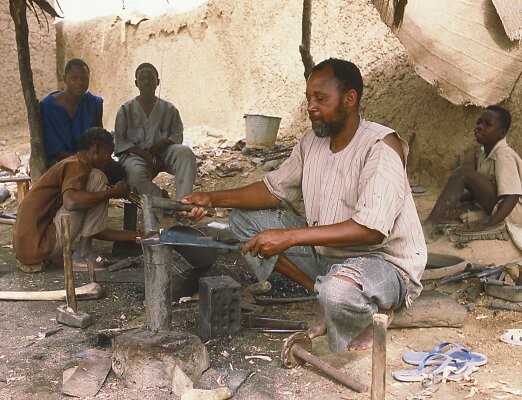 In the African concept, the members of the family are not limited to the father and the mother. All the others, who are in the neighborhood, who are in town, therefore all the people who are the same generation as your parents are considered your mothers and fathers. … All these people are not part of the family, but in our concept human beings are such that the relations are elastic. They could be relatives but we don’t know it. Therefore, to avoid saying if I had known, by sign of respect, we say father. mother. Children are educated in this way. … And it appeases the older people. When you say papa, mama it is more affectionate. At this moment the person comes back to a better mood. It makes them think of their own children. Even if the child has done something serious, they will pardon them. Before I was born, my cousins lived here. They spent their whole childhood here. They called (my father) “uncle”. I am born with them saying “uncle”. I can not come and say “papa”. Really it makes me feel bad too. If I said “father”, it would make them remember that their parents aren’t here. It is for this reason that I say “uncle, aunt”. If a stranger comes into the community, if you come you are welcome. You can eat when you want. You can sleep when you want until you want to leave. Therefore you have the support of the whole community if you have problems. I sense the community at the time of a marriage. That people will come to help either materially, or with human resources to support you. Death also shows solidarity in Mali. Those who can bring chairs, those who can bring food, and people are there for you for a week. 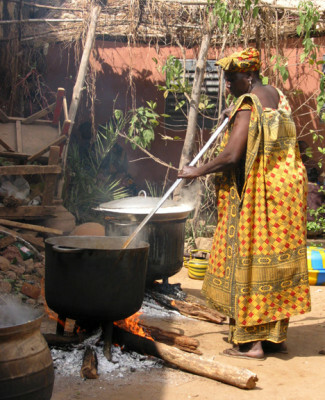 The relatives from the village stay for 40 days to support the woman. When I see a family, I go after a death is announced, the family has problems, because the husband has died, the children are there. The invisible hand, I go. I give a sack of rice, a sack of millet for my contribution. I do something. I am sensitive. Often I don’t bring money immediately but I bring things. God sees us. God helps everything in the world. It is a gesture. These are actions that are good. The community shows its solidarity in aspects of life. When a man wants to marry, he brings a basket of cola or a bag of salt with a little money, that the mamas share between themselves. The salt will be used in the sauce of the families. The trusseau of the bride is constituted by these mothers and aunts. The day when we are going to bring the woman to her husband, each of these mothers, who have received a part of the salt, money, cola, will be bring cloth, a calabash, cooking utensils. So this solidarity, your mother alone, we know that she alone can not constitute the trusseau of her daughter. It’s too heavy. This solidarity is our wealth that is here. Sinankuya is the cement of traditional society. It is an indispensable element for social cohesion and peace. Everyone respects sinankuya from the biggest intellectual to the biggest of the idiots, everyone respects plus con des idiots, tout le monde respects sinankuya. Everyone knows the importance of sinankuya. No one is against sinankuya. We don’t know when it was created. There is no leader. It is a perfect reality. I am a Mohammed Lamine Keita and in regards to a Kante, I am superior to him. We joke. He also takes measures against me. It brings only tolerance and peace. And jokes. There isn’t a leader. Everyone is sometimes master and sometimes slave. It’s a game. And even in the family when there is a little conflict someone who is the person’s sinanku can intervene in the family and put an end to everything and bring everyone back to a good mood. It is what accounts for the fact that there are fewer fights here. when things aren’t going well, it always ends in this way. This is its value. It is on this basis that the community and the family work. Sinankuya alone could develop Mali. Its influence is a good thing. It is the gas itself for the motor of the society, of the community and the family. Sinankuya alone proves our cultural pride. We glorify ourselves because of sinankuya. It is what explains why in Mali these are no tribal wars. No matter what the difficulty of a problem, the problem gets lighter, is eraced completely. It have made life and cohabitaton easy. And we are really proud of it. It is very very important. If I am in town and I have a little problem with someone and I know he is Coulibaly, I say. ” Ah, you see, it is the little Coulibaly who can make me sing.” Right away, I insult him. He knows I am Sissoko. He insults me and it ends there. It doesn’t go far. It welds the community. Sinankuya permits us to lower the tension in many situations. Its origins are either between brothers or someone who saved someone else from a horrible situation or someone who was employed in the family of someone as a slave. In general, sinankuya grew out of this sort of situation. We are all joking brothers. When the other is in a conflictual situation and you who are his sinanku comes right away. You try to make yourself a little higher, superior to him. You say everything. You insult him. You oblige him to stop. When you come into the world, you come between the hands of people. And when you have to leave again, you leave between the hands of people. It is these people who ask you. If they ask you, you have to accept. Even if you’re right. It is for this reason that people in the community and in the family are advised to find someone that you trust very much. Even if you’re right, if you do something and he arrives, he speaks and you stop everything. You say it is because of him. You must find someone and say it is because of him. For no matter what problem. When he arrives, you stop everything. You are the child of a woman and he is the child of a man, same mother, same father. Therefore you’re cousins. If you go for a whole week without teasing each other, its not good for you. If they see each other and they don’t attack each other, we even say it isn’t good for their relationship. Always create a good atmosphere in the family. when we see each other and we don’t attack each other, it means we are angry at each other. The elders who are there will say, “Ah, what’s the matter?” They will observe you for a certain period of time during the day and if really there isn’t this amicable interchange of attacks, they will call you. “But what’s going on? Are you sick? You are in a bad mood. ” If there is a problem, you are obliged to unveil it. We deal with it and start over again. Not long ago I saw on TV, there were 2 men who had an accident. They started yelling they were even going to fight each other. There was someone who came to intervene. He asked the first one, the name of his family. And he said he was Diarra. The moment he said he was Diarra, he found out that he was the cousin of the other man. So they started to joke with each other. And the argument was finished. That is the advantage of sinankuya. Underdevelopment is the lack of confidence in yourself. Underdevelopment is bad management. A community that develops, that is to say, a community that takes initiative a community that takes its destiny in hand, a community that works for its necessities, a community that manages to stop the negative aspects that are in each of its members, So that the community can develop economically it is necessary for the community to develop socially. There is no development. There are only projects. Every year we hear about the Struggle Against Poverty but poverty gets worse each day. We are regressing. On the contrary. We become poorer and poorer. Because we have lost our values. Money wasn’t so important. We bartered. I had clothes to sell and you had peanuts. We exchanged. You didn’t need money to dress yourself. These are the things that used to work. (Donors) come and give unwittingly. Give us work materials. Ask our needs. 200 kilo of rice, I’ll eat that in a month. And then I am obligated to wait for another gesture like that. Only God knows when it will come. We have even said, the gifts are really not welcome. They are sharp things. We are very strong at handicrafts, for example. The women make many mats but how to sell them? There is no way to bring them to market. The grandmothers have a role a little economic. They degrain the cotton and husk the peanuts. They also spin cotton. But they are also reputed to tell stories to the little children. Even the head of the family often comes to sit not far from the grandmother to listen to the same stories he heard as a child. The stories always have a moral. There are no retirement homes here. We take care of our old people because we have affection for them, ties to them. Our love allows us to keep them with us. There is a saying that is very current that says, “A child who cares for their parents will never be humiliated.” It is a reality. When I say humiliated, I mean confronted by problems, they will always find a solution. Their role is to stay in the family and tell things to the children to facilitate their comprehension. It is to teach us things from the past and to tell us what will happen. To help us understand life. In life always be like the others. To advise us. Not to do bad. In the community, old people are considered the depositors of our traditions. They teach us our culture, our traditions. They are the pillars of the family and the community. They hold the secrets of history, traditions. They have a big responsibility for active life. They are our memory. They don’t have the energy to do things but they have knowledge. We have energy to do but we don’t have the knowledge to do it. The two combined permits us to make things move. Older people are the guarantors of the society. 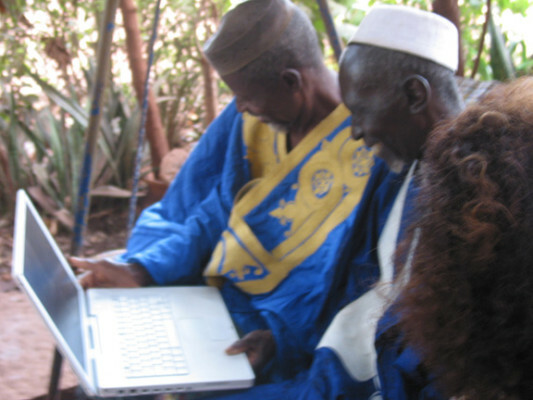 … They often help women educate the children according to the ancestral traditions. With modernity, the traditions, people are confused but with older people to direct us, how to educate our children according to the past. Otherwise we are often lost with modernity. A very important event is the day that a man can wear a turban. There is an age to wear it. It is cultural in the Tamaschek mileau, a very big event. And the one who will wear it never knows it is coming. It means that you have become a man. We can count on you. You can defend yourself. You are part of the brave men of the community. If there is aggression, you are among the men. A cultural event. The man is not informed. Among his friends there is always someone who is very close to him who can hold him and focus him until the men who come with the turban are ready. … To wear a turban, you have to calm him down because if he moves in certain ways, the turban will fall off. His friends of the same age teach him how to wear it. Once it is worn, you can’t take it off again. And then it becomes a party. His friends take him and go to visit the tents of the young women. They give you things to eat. They give you tobacco. They give you perfume. The men sing. The women sing. It is really a party to say that the son of that family has become a man, capable of defending his turban no matter where. Traditionally, man is the head of the family. He manages everything. The woman assures the balance in the home. The husband goes to work. It is the wife that takes care of the upkeep and the maintenance of the whole family, of the children. So the balance of the family rests on her. And contrary to what you might think, the woman plays a very important role in traditional society. She is the one that is the support of the family. Often we say to men, you must marry to be respected. A man who doesn’t have a wife is not respected. The big decisions will never be given to you. So women play a very important role. Men’s social role is to make decisions. But men don’t make decisions alone. There was democracy in our society. Man, when he spoke of a problem that concerns the family or the community, at night he asks his wife. “This is the situation. What do you think?” And since generally women are very wise, they reflect faster than men. When the wife gives her opinion and when the man agrees, when the men come together in the vestibule, he defends the position of his wife without letting on that it was his wife who said it. In our society women are very very very heard. I have decided I am going somewhere. I tell my brother. He announces it to my father. Then we have a meeting where we will see if it is feasible or not, if they agree or not. When the meeting is over. I do it unless I an recalcitrant and I abstain from this context. All the big decisions are made by the family or by the community. These days there is a problem in the families. Women are much more implicated now. Our men have understood that they alone can’t go without the spare tire that has a very important role to play in the development and well being of the family. So women are often consulted. Otherwise, we limited ourselves to the ancient system. Which was when there was a problem in the family if a decision was to be made, even in the community,, the men said to each other to put it off to tomorrow. And this tomorrow was to go ask the advice of their wives at night. The next day that came. They glorified themselves with the base that ha always existed and that always played its role in silence. Now everyone in the family and in the community has understood the role a woman can play. That is why this year the government required that women be included in village counsels. And in this little neighborhood, I am an counselor. A community needs to be organized around a certain number of leaders who guide the community in a good way. It is necessary that the community communicate. If they don’t communicate, they can’t know the problems. The people need to communicate. There must be meetings to talk about the real problems they face. There are always the old people, they are wisest around whom the problems are debated. … Even to decide to leave a place. There is no more pasture. Lets choose another place. It is a decision. 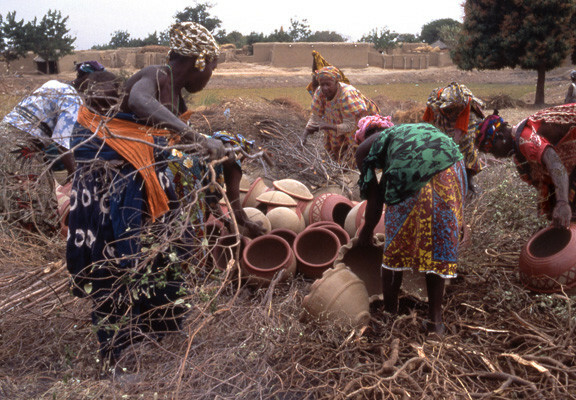 Women when they go to the fields, are informed about what goes on in the society. The grandmother who is there, sees everything. She doesn’t go out of the house. She knows everything that happens and all that goes on in the village. After a meeting, the head of the family comes to ask his old mother, we were discussing these things. What should I do tomorrow in the meeting? The mother, the wife, the sisters the women from other families will give their advice. Women spend more time with the children than men. They are the ones who educate the children. We say that a child who is brilliant, who succeeds in life is because of their mother. When a mother has a good education the mother teaches these qualities to her children. But is the mother doesn’t have a good education, this will be repeated in the education of the children, the life of the children. Traditionally, we wash the feet of the bride to say that she was single. We need to take off the odor of being single. We wash the feet of the bride with hot or tepid water to say to the woman, there are times in of life where it will be hot in the household, very hot. There won’t be enough money. There will be problems. You need to know how to deal with it. I have two families. 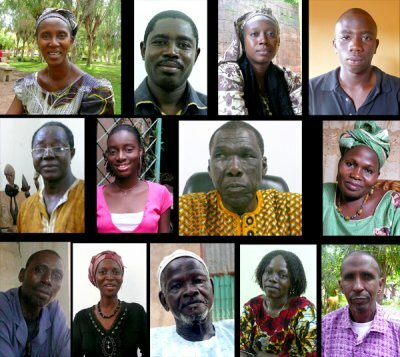 The Coulibaly family where I was born and raised and the second, the Traore family where I live now. 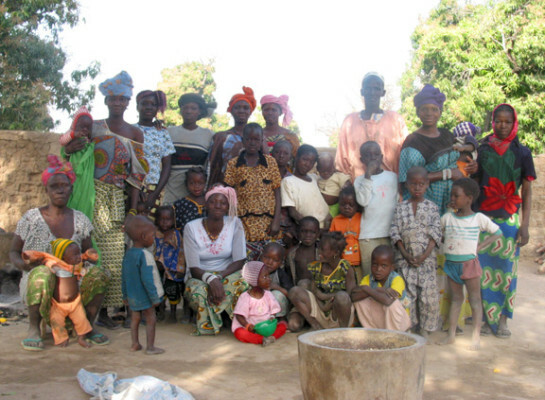 Practically all women in Mali have two families. There is the parental style that is about education and the conjugal style which is about the responsibility to educate and the responsibility to cultivate aspects of our traditions and our cultures, and to consolidate the ties between the members of my husband’s family. When your parents ask you to do something, to do a job, you must do it. Because they asked you to do it. They do everything to feed you. They do everything to give you what you need. When they say something you must accept it even if you don’t like it. Because they are your parents. You must respect them. You must see yourself what you can do for your parents. Even if they tell you to work before you go to school, you must do it. Children represent the image of the society. We inculcate the values that are the foundation of the society since the night of time until today. So the child is called to be the head of the family, the chief of the village. We do everything so that they have an education, guard the values. The role of young people first is to be well educated. If you don’t have a good education, you will not be able to deal with the things in life that aren’t aggreeable. Well educated young people will know where they are going, what they should do for the future to replace the older people. To know how to behave in life so as not to fall into traps that you don’t know how to get out of. Or your life will not be agreeable. Children are always the missiles between the sectors. There are the vectors. They go over there and create problems. … They create ties as well. A man can go over there and find a wife. 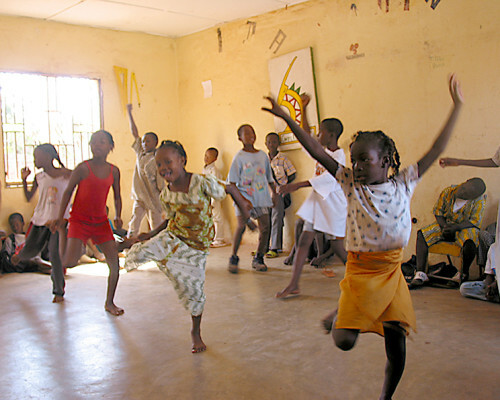 The young people, the children are the means of transmission between all parts of the community. Girls were brought together according to their age group under the watch of an older woman before whom they lit a fire and learned to spin cotton. And the older woman recounted legends, stories that passed on the tradition, the well being, the elements of courage, often even teaching them to sing and dance. Even the songs and dances were oriented towards the future preparation of the girls. The boys had the same sort of education as well. If I don’t know who I am, what my own values are, I can’t help my community. I am a future mother and I have homework. My children will take me as an example. To help my community is to form good children, good young people in being a good example for them. … The way I dress, the way I speak, the way I should be in my community, if I master these values and apply them, le children will do the same. In this neighborhood, I formed a youth club. They are 92 young people- boys and girls. Each first Sunday we hold our meeting and during the day we clean the neighborhood. No one can come to the meeting half dressed. I don’t tolerate that the girls come without proper clothes. I moved here a year and two months ago. There are elders who come to thank me for the fact that their children have change their behavior. I said, ” what we’re going to do first is that each meeting of the first Sunday, everyone will pay 100 FCFA, ( a quarter). … With that we bought brooms. The neighborhood was very dirty. Twice a month, we go out and sweep the whole neighborhood. … We did this once, twice and the parents came together, a representative of each family to thank me. … You see it is nothing to bring your little stone. This development can’t come from outside. Its us first. … Now the neighborhood is clean. There are fewer mosquitoes and we share the social aspects of the community. When there is someone’s marriage, the one in charge of communication goes from door to door informing everyone. We meet here and we go together. If the parents talk or not with the person doesn’t concern us. … It is like that that the little misunderstandings have ended. It is true that I don’t have enough money but I have an association of women. I can convince women. I talk with them, open their eyes. How to behave. With my little contribution I can do this. If I manage to convince five women, they also will convince other women. We have a meeting once a month. We talk about forced marriage. We talk about excision. We talk about girls who have failed, the girls who have fallen into a trap and have children. How to make them know that another life is possible. They can go back to school. The association is called Association Jalaton which means you should take responsibility, have the courage to resolve your problem. I had already worked with five girls in my papermaking studio. I trained them to make paper and I saw that the girls had problems. I managed to save four of the five. Three are married and one is not married but she is very serious. There was one that I couldn’t save. I saw that with only my words I could change certain people. My advice to young people of today is to be yourself. Don’t ever forget your references. They are African. Look to know who you are. And don’t be a copy of someone else. The others come with their own values and identity. You also, you have values. A tree that rests in water will never become a crocodile. Be yourself. African. My advice to young people is to work. It is work that wins everything. It is work that gives everything. When you are in good health, when God gives you good health, you must work. You will have your little bread. That is the advice of a teacher and a mother of a family. Only work pays. When I communicate with young people, the first thing- today things have changed. You must work. You must go to school to understand. Go to school. Understand something. But that is not to say always an academic track. Young people understand they need to join the security force. Go to school. Engage in activities that bring money. It is changing little by little to the satisfaction of everyone. When people are 16 years old, 17 years old, 15 years old, they start to change. Some don’t respect their parents anymore. Some leave the house in the morning and don’t come home until the evening. They leave to go to school but they don’t go to school. They go somewhere else. You understand. What I would like to say to them is to work. Study. Respect people. Even if you don’t know them, you must know and work in life. Respect. And pray. Even if you don’t participate in religion, even if you don’t pray, try to know God.